This graph shows how much energy is required to overcome heat from different parts of the home. Where does my home lose efficiency the most? Every home is different based on the materials and techniques used to build it. But in general, the areas that affect energy loss the most are walls, windows, doors, ceilings, floors, ducts, infiltration, and internal gain. Many of these are pretty simple to understand. Exterior walls change the most based on the weather outside. ICF walls (because of their insulation on both sides as well as the concrete sandwiched in the middle) do not rapidly change back and forth between the heating and cooling day and night. The concrete is referred to as “thermal mass.” Basically, because of the thickness and density of the ICF wall, it takes so long to change the temperature one direction or the other, the temperature instead stays fairly constant. 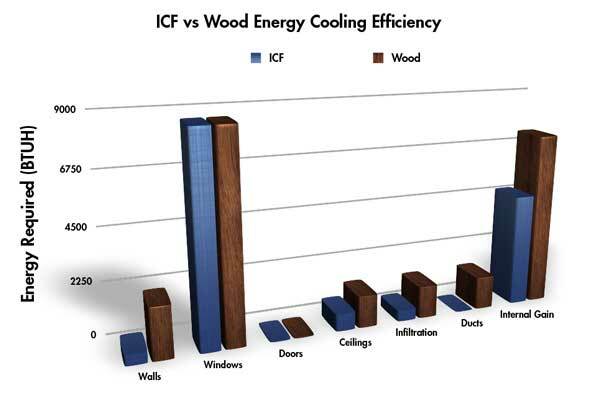 Windows don’t have the same thickness, insulation, or thermal mass of ICF or even wood walls. New technology such as multiple panes of glass, sealed gas-filled panes, and thermal sheeting make newer windows highly efficient. The natural heating and cooling cycle does affect windows more than walls and is one area where any structure will lose or gain heat. This graph shows how much energy is required to overcome heat loss from different parts of the home. Keeping the door closed like your mom always told you is a great defense against heating or cooling the outdoors. As we enter and leave the home heating or cooling is lost. The ceiling borders non-climate controlled space, otherwise known as the attic. Insulated attics still heat and cool based on the weather outside and conduct those changes through to the interior of your home. Using an insulated roof or decking system such as BuildDeck can shield your ceilings from the heat loss or gain. Also, you can use spray foam insulation to further insulate the space and provide more protection from changes in temperature. You can lose as much as 15% of the heat or cooling in your home through your floors. Many homes are built on a crawlspace or concrete slab foundations. Energy can leech from the ground and into your home. Whether overhead or in the ground, air ducts in the attic or in the walls can be a source of energy loss. Make sure your ducts are well sealed, clear of debris and dust, and insulated. Air infiltration is better known as drafts. Electrical plugs, doors, poorly sealed windows and plumbing can all lead to drafts. ICFs eliminate most of these because the electrical chases and plumbing are just cut into the foam and are not exposed to the outside. Usually, the largest sources of internal heat gain come from appliances. Eliminating these can not only directly reduce energy usage (if the appliances aren’t running, they are not using energy), but indirectly they keep the temperature of the building, lower thus reducing the energy used by the air conditioner. Stoves/Ovens, Incandescent lighting, dishwashers, clothes dryers, showers, computers, and television all give off heat. This heat isn’t such a bad thing in the winter, but during the summer it adds to our cooling bills. 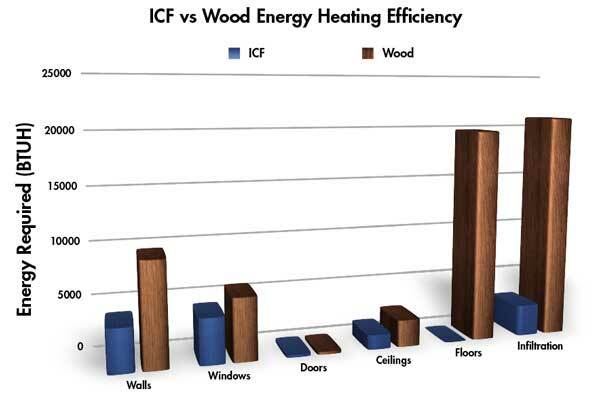 ICFs are much better because you’re maintaining such a standard temperature, the internal gains are fairly constant.